The five-vitola MBombay Habano line made its debut in 2015, joining several other blends from Mel Shah’s house-brand-turned-national-release. It is made at Tabacos de Costa Rica with an Ecuadorian Habano wrapper, Ecuadorian Criollo binder, and filler tobaccos from Nicaragua and Peru. The Gordo (6 x 60, $12.50) has a balanced bouquet of flavors ranging from warm tobacco and roasted nuts to cream, caramel, and a gentle woodsy spice. It smokes OK, though the burn line tends to meander and the draw is a tad tight, especially for such a thick cigar. 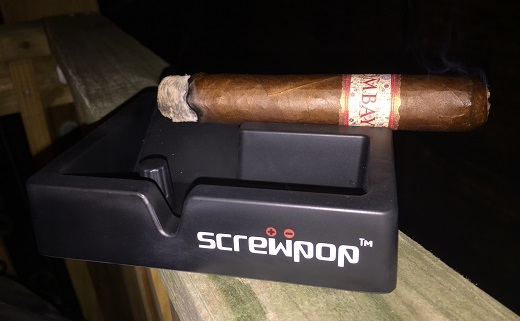 I suspect I will appreciate the other MBombay Habano vitolas considerably more; my enjoyment of this cigar is limited by its excessive girth.